What are children At Risk Teens? At Triangle Cross Ranch we are curious about why kids do the things they do. Most of the children in our care are dealing with loss of some kind. It may be a divorce, the death of someone close to them or a series of disappointments. Even placement in residential care can represent a loss of familiar surroundings and friends. It’s hard to find the one thing that is going to reach Therapeutic Boys Ranch. Teenage substance abuse and addiction can lead to tragic outcomes. Don’t let that happen to your family. Now is the time; before he or she turns 18 and you have little say or control. Reach out and get help. We know that typically when children are having behavioral problems, we can trace those problems to one or more needs represented in Triangle Cross Ranch of Leadership and Service. How our Therapeutic Boys Ranch Works? Through our Therapeutic Boys Ranch Programs, we are able to reach the root cause of behavioral problems and help a child work through their issues to get their needs met in wholesome ways. Through these programs, your boy/son/teen becomes more self-aware and learn strategies that will help him throughout their lives. How do you get your Therapeutic Boy Ranch teen back on track? 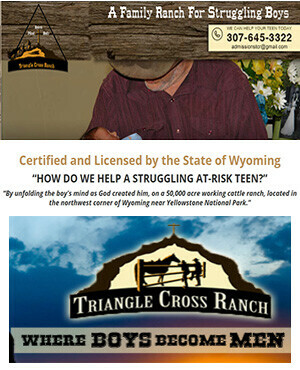 Therapeutic Boys Ranch Programs at Triangle Cross Ranch provide many first time vocational experiences to help our young men discover their own God given talents, worth and potential. Some boys engage in logging, operating farm equipment such as tractors, a backhoe and bulldozer, irrigating crop land, training stock dogs, and caring for baby calves. Our academic programs for Therapeutic Boys Ranch youths can help.